Following on from part 1 last week, here's the second installment of our time-filling/warm-up selection. Good for lower grades/abilities. Everyone knows hangman, and Feed the Shark works on the same principle. Draw a set of stairs to nowhere on the board (however many steps you want. 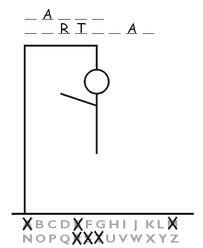 Hangman has 10-16), and underneath the last step draw an angry shark, or spikes etc. Students have to guess letters for a word in the same way as with hangman. e.g. watch = _ _ _ _ _ and they must call out a letter. Wrong answers mean that the character moves up one step. Clear? Very simple game for low ability/elementary and 1st grade JHS. Works best with small classes unless you have tons of cards and can play in groups. Make a set of cards for any one vocab group (subjects, colours, animals etc, etc). Make one or more of each card. You can write the word on the card, draw a picture or both, depending on the aim of the class. Call out one of the words. Students try to find and grab the called card before anyone else. Great fun game for elementary/low ability. Bigger (over 20 students) classes can be a bit of a strain, and kids at the back of the lines will get bored. Make around 10 sheets with a word/picture on each from the target vocab/review. When the two students meet in the middle, they janken. The loser goes to the back of his/her group line. The next student from the losing group must start again from the beginning. The aim is for one student to get all the way across the board. If they do, the team gets one point and they go to the back of the line. Keep going until time is up/they're sick of it. Note: this isn't a good idea with months or days of the week unless you swap the two groups around halfway. Again, good for low ability/elementary, but not so good with big classes. Up to 30 is probably okay, but in elementary school it will have a much higher turnaround and may work fine with a regular sized class. Split the class in half and have them line up either side of you. Stand in the middle with a piko-piko hammer (plastic hammer with a sqeaker/whistle inside - can be bought in any 100 yen store). Two students face each other and must say an English word. You can make it subject-specific if they can handle it, or just anything at all otherwise. The first student to repeat a word that either of them has said, or to hesitate for too long gets smacked on the head with the hammer. Elementary kids love the senseless violence of this one. You can use a point system for the teams or just allow them to go through once or twice and see who uses up their team fastest. A good review exercise taken directly from MES-English. Good for all JHS grades. If they get it right they double their bet, if not they lose it. Simple but fun, and good practice! Good for 1st grade JHS, and could also work with later grades if you think they'd like it. Prepare sentences. 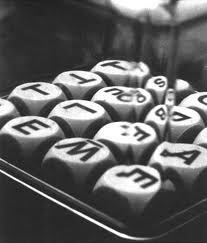 Make them all the same number of words long . Make groups with the same number of students as there are words in your sentences. Kids all pretend to be asleep (faces down, can't see you). All out the numbers one-by-one and show them a flashcard of one word from your chosen sentence (chose words at random). The kids go back to sleep and you call the next number. When you've called all the numbers, have the students wake up, tell each other their words and try to arrange them into a sentence. The fastest group wins. Just like your favourite kids game. Good for 2nd and 3rd graders. Make groups of 2-4 students . Write 12 letters at random on the board. Groups have to come up with as many words as possible. Extra points for the longest word. Well, that's your lot. If you have any good suggestions for a third part to this entry, then please let us know in the comments below.